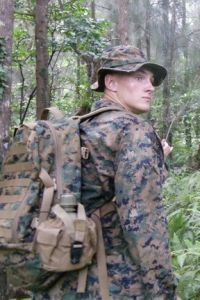 September 2011 Hero – U.S. Marine Lance Corporal Craig Kanya Jr. The Round Lake Area Exchange Club Hometown Hero Committee is proud to announce U.S. Marine Lance Corporal Craig Kanya Jr. as their September hero. This month’s sponsor is Trustee Judy Armstrong of Round Lake Beach. Kanya resident of Round Lake Beach and a 2009 Antioch High School graduate, was registered at the Clubs site, www.rlaexchange.org/hero, by his father, Craig Kanya of Antioch. Kanya is currently stationed at the Marine Corps Air Ground Combat Center, also known as 29 Palms. It is located in California and is the United States Marine Corps’ largest base. He has been in the Marines for over two years and served a tour of duty on the U.S. Essex aircraft carrier in the Indian Ocean. His honors include Marine sharp shooter and squadron leader. The Club will present a plaque on behalf of the September Hometown Hero to his family at their meeting on September 14 . The meeting is held at Panera Bread in Round Lake Beach, 7:30 a.m.